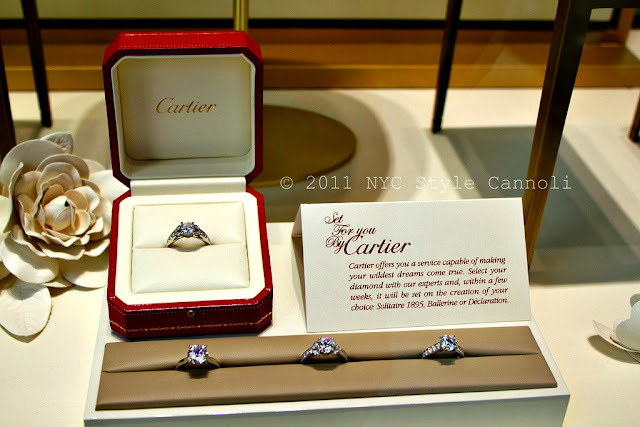 Photo Gallery Tuesday " A Cartier Ring"
Founded in Paris, France in 1847 by Louis-François Cartier, the company remained under family control until 1964. The company maintains its headquarters in Paris and is now a wholly owned subsidiary of Compagnie Financière Richemont SA. The Solitaire Cartier collection began in 1895 and have been well sought after ever since. A classic ring for the lady who has the utmost style. Cartier is well known for its exquisite jewellery and wrist watches, including the "Bestiary" (best illustrated by the Panthère brooch of the 1940s created for Wallis Simpson), the diamond necklace created for Bhupinder Singh the Maharaja of Patiala and the first practical wristwatch, the "Santos," of 1904. It is always fun to peek in the Cartier windows, and in their Fifth Avenue store, where a girl can always dream. Cartier is one of the best! HaHaHa I love their ad campaigns. They're always exquisite. Welcome Rosy, so glad of you to join us !! Yes, Kim, Cartier is one of the most wonderful brands. Pure elegance! !